I enjoyed this article. It’s clear and to the point. While many may not care for the Michael Voris’ style or presentation, anyone who watches his Vortex episodes with some sort of consistency knows he’s not calling Catholics to disobey priests, bishops or clergy on doctrinal issues, but reminding us that as Catholics, we’re not bound to obey non-Catholic or anti-Catholic behavior. Thanks for dissecting deacon’s weak attempt to vilify Michael Voris. He is on a different track. He is trying to spread the faith. His zeal is obvious. You don’t spread the faith – the real Faith – by supporting or ignoring von Balthasar, Cardinal Dolan, Fr. Barron, or any other squishy cleric. Nor do you spread the Faith by casting aspersions on the pope. You spread the Faith by educating people on things Catholic, and, pointing out where the hierarchy deviates from the Catholic Faith, when necessary. (The pope is a special case. You can’t denounce him to non-catholic audiences because to them, he IS the Catholic Faith. That requires much more prudence, and I applaud Mr. Voris for his restraint). There was once some Guy who stood up to be counted, and they crucified him. There were a bunch of others who followed His example, and they were done away with as well. But in the meantime, that group of folks, on their way to death, founded, fostered, and grew the greatest organization for good the world has ever known. Of course, there were some who went along to get along. We never hear of them. There were also a few who actively opposed its growth. Their names are written in history as failures (and elsewhere as condemned). Today, we only see the milquetoasts as they depress us in our own struggles to grow in all things Catholic. They’ll be forgotten as well, despite the trials they put us though. 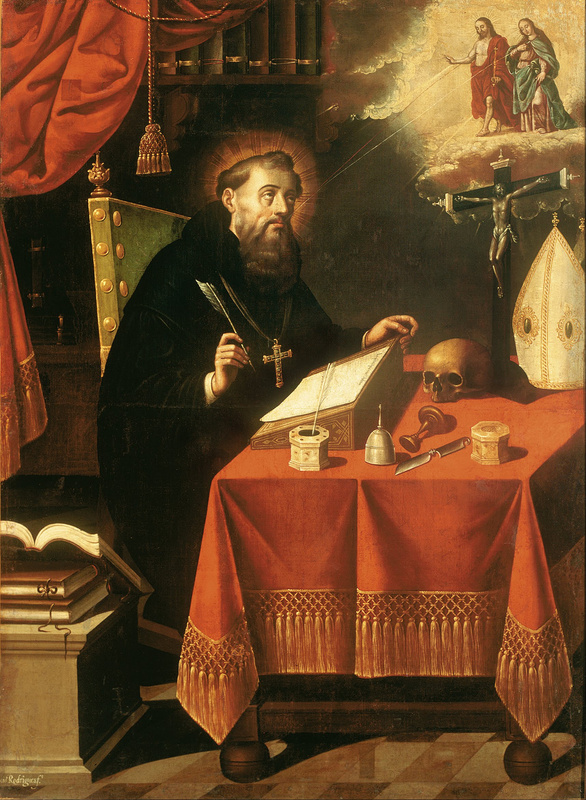 Christ founded the Church for His elect. He gave His life for it, and so did His greatest followers. I see Michael Voris filled with zeal for the Truth, and I only wish I had the courage to be that way amongst my friends and family…let alone the world and the powerful members of the hierarchy. May God bless him, and all those who fight for the Church with zeal. Zeal. We don’t see much of it today, do we. Not like back in the day when some Guy was denouncing the prelates of His day as whitened sepulchers and driving folks out of the church with a whip of cords. I wonder what happened to that sort of attitude. Did we out grow it? I agree with Allen. Zeal for souls means a love for Christ and his Church. That is what the Church Militant crowd has! It seems that Cardinal Dolan fits Malachi Martin’s description of someone who is “perfectly possessed.” Arrogant and can smile as he slithers through doing his destruction to Jesus’ church. Follow this man is not going to get one to heaven. Remember what our Blessed Mother said at Fatima and Garabandal, that Priests and Bishops etc would be leading souls to Hell. The comments that mention Pope Alexander VI should be altered to reflect the fact that the “Banquet of Chestnuts” is regarded by most scholars as a later addition (a forgery) to Johann Burchard’s diary. There is every reason to believe that, at least while in the Papacy, Alexander was, overall, an outstanding and wonderful man. I’m writing a short, well-cited “Apologia” book for this particular pontiff at the moment, and I am particularly sensitive to what I know are unsubstantiated rumors about him. I haven’t seen that most scholars regard the Banquet as a forgery to Burchard, although I have seen the case made by De Roo. My understanding is it is still widely accepted among authorities. If that’s wrong, I’m happy to be corrected, and I look forward to seeing it in your book. Nevertheless, my point in using the example that even I have certain reservations about is because it is an obvious counter-balance to this whole Pope guided by the Holy Spirit business. Even if the banquet didn’t happen, I know of no source that denies his illegitimate children, obviously Lucretia, or, eventually, a generation later, St. Francis Borgia. Nor does any source I know of contend he did not have a wild time, albeit less of one than Pope Leo X, who famously declared “We have the Papacy, let’s enjoy it.” One could add to that his failure with the French I suppose. 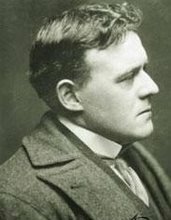 Regardless of any of that, since Alexander’s failings are the most well known in the modern popular imagination, and at some level are documented (even if that one is a red herring) it serves the purpose of pointing out that Popes are not guided by the Holy Ghost, merely protected from formally binding the Church to error. Do let me know, however when your book comes out, I would love to revisit that period. Anyone who has become a disciple of Jesus Christ can be led by the Holy Ghost. It is a matter of giving up our own wills and submitting to His Holy will. If this is possible for you and I, then it is certainly possible for the Popes also. [Editor’s note: This is not what we are talking about. It is often claimed the Pope receives an extraordinary direction by the Holy Ghost as a charism of the office, and therefore can’t be criticize because he is “guided by the Holy Ghost”, which the Church has simply never taught. We’re not talking about the normal aid of grace which everyone receives regardless of how faithful we are to it] Conversely, anyone who doesn’t submit to God’s Holy will, but insists on doing things their way, will not allow the Holy Spirit to lead them (whoever tries to save his life will lose it). Again, any Pope can refuse to submit, and therefore lose his salvation. Dear Rubens: Correction: Bishop Flavin, not Flaven. Another major error in your attempt to illustrate the good Bishop Glennon P. Flavin (God rest his soul) is that he was NOT extremely progressive. That denotes an extreme LIBERAL. He was not, he was a Traditionalist by all means. He kept the Mass holy and reverent, supported VOCATIONS to the priesthood and religious life like no other in his time, spoke out against contraception, had a true and lasting devotion to Our Lady, gave up his bishop’s mansion to house sisters that he promoted to come in to the diocese, wanted sisters to wear the habit, forbade alter servers and had only men be altar servers and lectors, instituted the acolyte program and dismissed any notion of “eucharistic ministers.” I could go on with more but I really have to question your outlook on Bishop Flavin. I am happy you told a story about him but please do not call this beloved Bishop “progressive” and I would like an e-mail back and a correction made in your next article, if you would please. I have fixed the spelling error. Not sure if it was a typo or that just didn’t look it up. When I spell check the names are always in red anyway so I probably glanced at it without taking a second look. As far as the assessment that he was progressive, this comes from the testimony of priests who I knew that were active in the Lincoln archdiocese, as well as two who taught in the seminary who were from outside. Now, it may be he rejected all of those things, but that was in 1968, it was easy to be progressively minded and not have gone that far. Progressive, at least to my mind, is not the same as pincko commie lib, even extremely. Maybe I could take extremely out, but that is the assessment given me again by people who were in the diocese shortly after he left. Correction #2:” …shortly after he left.” He never left. He retired in 1992 and stayed in residence in Denton, NE and died of cancer in 1995. He is buried in the Lincoln diocese in the Cathedral of the Risen Christ in Lincoln, NE. He was 79. Question: Since you explained what “progressive” is not, would you please explain what it is. I don’t understand your reply in your response to me about what you think a “progressive bishop” is. Perhaps we can conclude our disagreement after I know what these terms mean to you and can rationally criticize our differences. Your article about Bishop Flavin’s will to confront abusive priests and not have lawsuits came from a VERY CONSERVATIVE / TRADITIONAL minded bishop, not one thought of as “progressive”. I cannot believe any progressive bishop could be given such a credit to perform heroic acts like Bishop Flavin had performed. (i.e. 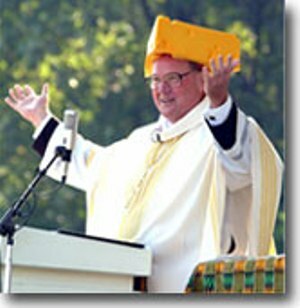 ex-bishop Weakland). I still think you need to correct this in your next article. Thank you. I support Michael Voris and his ministry in totality. He didn’t convince me; he is alligned with my observation as a faithful daughter of the One, Holy, Catholic & Apostolic Faith. The Church is in the state of apostasy. Woe to him/her where scandal cometh. Deo Gratias. Christus Vincit. Mater Dei, Ora Pro Nobis. It is comforting for me to read that people are supporting Michael. May God bless you in the best way possible for you today. Me too. Malia. I felt Like jumping up and cheering when Michael was finished. He voiced my exact sentiments as I’ve watch Cardinal Dolan make a mockery out of chastity. I just signed up to receive all notices from Michael Voris via email. On a separate note, there is a Rosary Crusade brewing to demand the consecration of “Russia” and not the “World” to Her Immaculate Heart. This is in preparation for the ushering in of the French Catholic Monarch and the consecration of France to Our Lord’s Sacred Heart. Remember, St. Margaret Mary Alacoque was tasked with the commission to go to King Louis XIV and command him to consecrate France to His Sacred Heart, he refused and 100 years later the Revolution took place. This mission is critical now. If they don’t consecrate “Russia” to Her Immaculate Heart, we will suffer the same fate. The Faithful everywhere are rising up. PRAY THE ROSARY AND PREPARE FOR BATTLE. Mater Dei, Ora Pro Nobis! Christus Vincit……- the Lily of France! I totally believe that Mr. Voris is right on with his comments! I totally agree with his stand against the poor choices that Cardinal Dolan is taking with this issue. One can’t help but wonder if Dolan is getting paid under the table to be a vessel of approval regarding the Gays. I can’t help but wonder if Dolan would so readily accept other peoples choices of sin, and to march with their banner….adulterers, thieves, drug addicts, child molesters, pro-abortion? I have a hunch there is more to what makes Cardinal Dolan tick than what we know. If he was truly a good Catholic leader, he would not even consider allowing the sodomists to march. So why is he? What is his agenda? I wouldn’t be surprised if that turned out to be true, but we don’t want to go too far without proof. It seems to me more plausible that Cardinal Dolan was always more on the liberal side, but played the game under Benedict, (remember, company man) and now that the wind has changed under Francis, and he can’t go higher, he is showing his true colors gradually. Whenever I hear Michael Voris speak, I picture John the Baptist in Matthew 23. “Woe to you scribes and Pharisees, you hypocrites. You cleanse the outside of cup and dish, but inside you are full of plunder and self-indulgence.” We need some John the Baptists, they remind us to stay awake for the coming of the Son of Man, whether we like their style of speaking or not. All good points, but: how can anyone possibly say that the Church of the Holy Innocents is the most beautiful church in New York City? Beauty is in the eye of the beholder, and Holy Innocents has a sentimental value for many, but it is pretty ghastly on all counts, and filled with some outrageous kitsch and a third rate fresco badly restored, besides being an inferior example of Victorian Gothic. A New Yorker or professional architect write this could not possible have made such a judgment. I can easily think of a couple of dozen churches in Manhattan far finer in every way. Not to quibble, but such an absurd comment might cast into doubt the truth of the rest of your fine article. Excellent commentary. You mention Church of Holy Innocents. I find it prayerful when I visit Manhattan – an oasis in all that confusion of the Garment District. But – “the most beautiful church in New York?” – with all due respect, you must be blind. Mr Voris and his broadcasts were removed from the Diocese of Detroit years ago because he pointed out the infamous Cardinal Bernardin link to CRS and CCHD links-money going to pro abortion & Homosexual groups. Dolan like those in Detroit are seeking to oust priests from SA(Holy innocents Latin mass parish) and others Mr. Voris included are under vile attacks for similar blogs condemning his-Dolan’s many legion of gaffs. 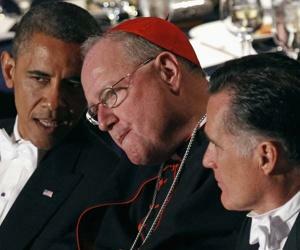 He Dolan is a public disgrace called “Bravo Cardinal” for his George Sam-FB player coming out rant-Bravo!!! and St Francis NYC Homosexual parish video-Dolan fiasco. Lastly the Liberal Pro Homosexual-Abortionist NY Times newspaper has stated on Numerous occasions how Inept and Ineffective(NY Times terms Not mine)Dolan, Hubbard and Clark are and were at promoting any aspect of the Catholic faith and stopping the pro Abortion-Homosexual marriage agenda of living in sin liberal Gov. Andrew Cuomo. Not surprising the attacks on Mr. Voris coming from Dolan and his mouthpieces- not real journalists as was done in Detroit as well. Keep up the good work Mr. Voris. You can tell a man like Mr. Voris for the phony Catholic attacks though vile in nature are typical when you expose wrongdoing in the one true faith of the Catholic Church.Like Hubbard and Clark- Dolan should RETIRE before he disgraces the clergy like he and Bishop Bonney of Belgium(Similar gaffs-lack of faith and beliefs in Catholic doctrine etc. to Dolan) has done already. I would actually have to agree with Michael Vorris’s stance on Islam: It is indeed a heresy. 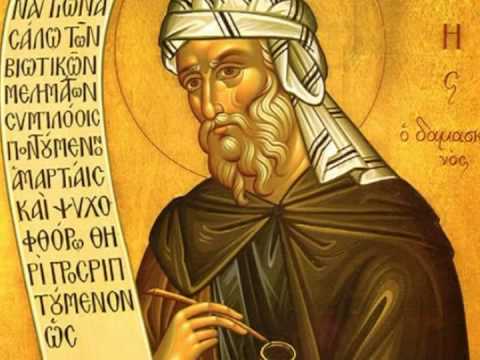 Islam REJECTS THE DIVINITY OF CHRIST, just like Arias, the priest, denied the Divinity of Christ, with his heretical Arianism, which lead to the Counsel of Nicea. Islam says he was a “prophet of Allah”. and “Allah” is not the God we believe in. Our God is the Father, the Son, and the Holy Ghost, a Triune God. They reject our Trinitarian God. Also, what they say about Heaven contradicts what Jesus, Our Blessed Savior, teaches about heaven. Jesus said we would be like the angels who neither marry nor are given in marriage. Islam teaches that there will be 72 Virgins in heaven, which is against the teachings of Jesus, and the Catholic Church. And by so by saying it’s not a heresy, you’re saying it’s a true religion yes? and doesn’t the Church teach that it is the only way to heaven? The Apostles preached that there is only one way. So, there can’t be both. it’s either one or the other. or none at all. You can’t mix truth with untruth, because then it is a lie. and if it is a lie, then what should we believe in? [Editor’s note: I think you got mixed up. The person denying Islam is a heresy is the deacon who attacked Voris and defended Dolan, or else you missed my comments shredding what the Deacon said. Go back up a few paragraphs. As far as V2 being modernist, of course it is, but the issue is it does not teach what that Deacon was teaching it did, not whether it is good or not] V2 btw isn’t a good reference. It mixes modernism in with Catholicism, which St. Pius X, and many others before him have warned us against the evils of modernism. There is a trend I am seeing here that I think should be nipped in the bud: I wrote this piece to defend a fellow Catholic from the attack of the lukewarm, who called a spade a spade, even though I don’t always agree with Voris or his style. That Dolan’s behavior is in fact evil I do not deny, but we cannot lose sight of the fact that, as St. John Eudes says: “Wicked clergy and shepherds are a sign of God’s displeasure with His people.” While there are many bad bishops and bad clergy, we need to remember to pray for them. It is one thing to point out the things they do which are wrong, it is another to hate them or write them off as the devil’s clergy. We need to not lose focus of the fact we see these things because God has given us the grace to do so, and we are responsible for praying for bad clergy to convert. I couldn’t agree more, undeserving wretch that I am. A true and faithful Catholic always prays unceasingly for oneself that he/she might not fall prey to temptations of any/all sorts; to pray for the Church overall and as a whole, regardless. This is the “truth” in charity and the militant way. As such, we are strengthened in the face of adversity and bold in our speech. One could construe this though as being insolent and defiant, but quite the contrary; it is tenacity of spirit like that of John the Baptist and any other soldier and/or martyr who loves Christ and His Church. It is a spiritual warfare after all where we, the faithful, must be on guard at all times. Many leaders of our Faith have failed horrendously in their duties as shepherds and caretakers of the flock. Dolan does not hold monopoly over this, which is precisely why the faithful are restless and overwhelmed by such profane language spewing from the upper echelons. A person should not risk losing his/her own soul by subjecting oneself to bad company, bad clergy, negative influence and false doctrine. There are no other weapons given but prayers. The faithful are not oblivious to this. Let us put on the armor of Christ (Ephesians 6:10-18) and let things fall as they ought. In Christ, Be the Glory! Let us never cease to pray for our clergy. Every night I conclude the Rosary with a special request that God protect our shepherds (and lift up the petitions of the Holy Father). Personally I think Voris is a cult of personality, the comments here show that. Most of your posts get a couple of comments at most, this one has 42 when I checked. In my car I listen to Fr. Wolfe’s sermons, he quoted I believe St. Ignatius who said essentially don’t let worldly affairs disrupt your peace of soul, do your duty in your state of life faithfully. Voris promotes the exact opposite. He doesn’t build up, he tares down. Especially the hour long video with Voris essentially trying to give an objective explanation of the SSPX, he has since taken a complete about face on that. I wonder now though with his criticism of the SSPX, from what I’ve heard would Voris also dislike The Latin Mass Magazine? Would he dislike Fr. Ripperger, in particular Ripperger’s article “The Merit of the Mass”? Pope Francis just made Fr. Barron a Bishop, do you think Voris is going to speak out about that? Or now that the Pope has done this is Barron’s views on Hell no longer a danger? It’s inconsistent, it’s hypocritical. That’s why Voris’s style is not the way to go. All he is doing is stiring the pot, he isn’t drawing people towards holiness. And it’s not just him, I’ve encountered it with some other Canadian bloggers. You look in the comments section and they are all out arguing with anyone and everyone who they disagree with, to the point of it just being a shouting match with names flying back and forth. This article is almost a year old now though, it’s rather interesting reading it in light of all that has occurred in the past year. And by “this article” I mean your blog post not the Latin Mass Magazine article, though that comment would apply to both I guess. This is true. At the time I watched Voris occasionally, and did not care for his style at all, though I thought he did well calling out the hierarchy. Now he is making the typical course to be mainstream, by attacking the SSPX and his competition, the Remnant. Criticize everyone but not the Pope, etc. If I wrote this article now I would take a very different approach, and I’ve thought about revisiting it. That would be interesting, what he would do, especially if he discovers I worked at an SSPX school for 5 years! Who knows. I just try to be constructive and not engage in foolish verbal bomb-throwing, like you see in so many other venues. I might be wrong, as I saw in the Bishop Finn post where I foolishly waded into that, still I try to be constructive and useful. All I know is that Voris’s presence at the pre-Synod last year saved the day! He was instrumental in getting out the truth about what was going down with the German coup attempt and the Vatican staff’s complicity in it. He got the African bishop’s speaking up. He asked the pointed questions and didn’t back down. Thank GOD for his tenaciousness and determination to hold these men’s feet to the fire! In a time when it’s hard to know who can be trusted in the media as well as among Church officials, I trust him. He’s going to tell it straight, and he has good nose for BS and double speak from certain bishops. I say, keep it up Michael! The Church needs you. God bless your apostolate and all the lay apostolates who are showing themselves to be heroes and champions of the true Faith. I’m no groupy. I simply appreciate truth-tellers, who seem to be in short supply these days. The truth always hurts especially when it rocks the boat of those who have chosen to move the Barque of Peter off course. Hooray for Michael Voris – hooray for all those who stand up for the true teachings of the One, Holy, Catholic and Apostolic Church – and may Our Blessed Lord protect all the truly faithful Catholics who treasure the Church because of her hard teachings and Truth. I used to support Voris, but I can no longer do that in good conscious. He gives the priests and bishops a good thrashing for their outrageous behaviors and statements, but he refuses to criticize the man who is their boss, who allows them to get away with these outrages. None of these things could go on unless the Pope was turning a blind eye or actually approving of them. No, Michael Voris says, no, the Pope is special, you can’t criticize him! As a former cult member, I find this to be extremely dangerous. Cult leaders will not tolerate any criticism of their actions or teachings. As a result, people can be hurt or killed. While I know the Church isn’t a cult, the attitude Voris is demanding from his supporters is cultic. No one who has been through the cultic experience, and found true Christian faith, can support the blind faith Voris is demanding. No, the Holy Father must be criticized for his bad leadership, we can’t be a partaker in his deeds. I support Michael Voris and I don’t follow Francis; Papa Benedict is still my POPE. What does this mean? I, daughter of the One, Holy Catholic and Apostolic Faith, can and am able to make distinctions. I defend and support authentic teachings of the Faith from the beginning and in its TOTALITY. I am a servant and devoted child of Mary. St. Michael is my general at War and the Holy Spirit is my Paraclete. I shod my feet with the Gospel and the Holy Mass – Latin Form – is my safe haven. The Eucharist is my spiritual nourishment and Holy Bishops, Cardinals, Priests and Laity are who I stand with. Whatever description you give why you dislike Michael, just make sure that you are aligned with Authentic teachings and God is First and Foremost. That is what matters and takes priority. Could I ask, what cult were you previously in? Malia, I was in the Herbert Armstrong founded Worldwide Church Of God cult. How can Benedict be your Pope? Francis, bad as he is, is the Holy Father now. I am aligned with the church and it’s teachings. That’s why I can’t support Voris anymore. He’s making blind obedience to the Pope as a requirement of the faith. If he doesn’t want to point out Francis’s failings or criticize him, he’s free to do so. But, if he wants to tell intelligent Catholics not to speak out about what is actually happening in front of their eyes, he’s no better than the leaders of the cult I was involved in. We were told to keep our mouths shut or get out. Mikey doesn’t have the power to excommunicate people, but I’ve heard he will revoke premium memberships if someone complains about his no pope criticism policy. Typical cultic behavior I only know so well from years of experience! Stephen, when I say Papa Benedict is my Pope and he is still the Pope as long as he is alive, it is because Francis is the “False Prophet”. I will not mince words even if I differ with Mr. Voris. I have no intentions to convince anybody, but I expect people to discern with the highest regard that the White Horse of Apostasy is in our midst. Papa Benedict is still the Pope whether people like it or not and regardless of the outcome we now face. I follow traditions and teachings of Antiquity and again, I do support Mr. Voris for calling out the madness and holding unholy priests, bishops and cardinals accountable. St. John Vianney tells us “Do not try to please everybody; try to please God, the angels and the saints. They are your public.” Deo Gratias and Christus Vincit. Malia, Pope Benedict resigned from the Papacy, he’s no longer Pope. Francis, whether we like him or not, is the Pope. He was, as far as we know, was legitimately elected to that office. So, unless he’s declared an anti-pope by a future church council, his papacy must be accepted as legitimate. As for calling Francis the “False Prophet”, you’re way out on a limb here. While he’s certainly saying things that are wrong, to label him as “The False Prophet” going overboard. What proof or authority do you have to say this? It sounds to me like you’re trying to set yourself up as a seer. Please talk to your priest, for I believe you’re heading down a wrong road. Stephen, Pope Benedict is my pope, period. Francis is the false prophet, which is my personal assessment and discernment. “Seer” is your own fabrication and presumption. My priest is conservative and allows Latin Mass at our parish. We receive communion in the mouth and kneeling at the rail. 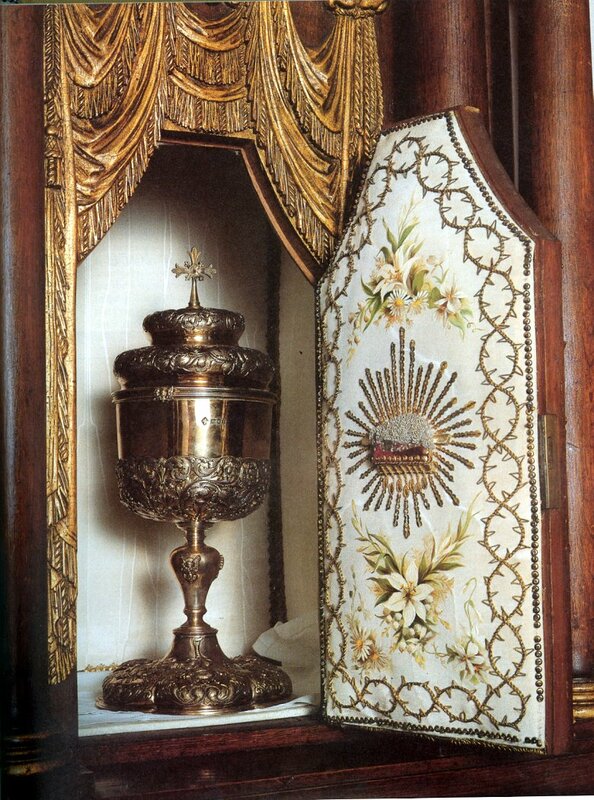 The Novus Order is celebrated in such a way that he faces the altar and not the people; There are no Eucharistic ministers because he distributes communion himself. Point being and most importantly, he is fully aware of my reasoning and my assessment because I will not mince words, and I will not be silent about anything. Given so much confusion within the church and her members, I will stick with my gut instincts and remain with the traditions/doctrines and dogmas in totality. I will not follow any apostates and wolves in sheep’s clothing because you’ll know them by their fruits of their labor. I’ll carry my cross and we’ll part ways. Please make sure you don’t leave the Faith and follow another cult. People have a tendency to fall back in their errors, especially given the abomination of desolation times that we are now in. Deo Gratias. Christus Vincit.. This is scary. You are following your gut rather than the successor of Peter. You (with the blessing of your priest??) are setting yourself up at your own Pope it seems. We, the flock, have not been given the power to determine whether St. Peter’s successor is a true successor or not. Any Pope can make mistakes, even serious ones at times, but never so serious at to change the teachings of the Holy Ghost. Please continue to pray for the Holy Father and for all Bishops, that they may remain true to the Traditions of the Church and be open to correction when necessary. Pray for all the flock too so that we are not lead astray by our own “guts” (to borrow your expression) or by false teachings. But never, NEVER, imagine that a Pope is not the rightful successor of Saint Peter unless the Church determines so. Reginald, a true and faithful Catholic – Militant that is – always prays unceasingly, regardless. Papa Benedict is the true Pope. Francis is the False Prophet. I did not mince words. 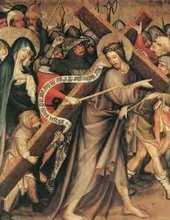 Carry the cross and be on our way. Prepare for Battle. Deo Gratias. Christus Vincit!!! In Christ, – the Lily of France! c) Francis was not merely materially, but in fact formally in the traditional sense the Church has used the term (not as sedevacantists use it), a formal obstinate heretic prior to his election, which would mean his election was invalid, and if Benedict resigned it would mean we really haven’t had a Pope since 2013. All of those possibilities are disastrous for the Church, and in my view, worse than the present situation with Francis as Pope, and Benedict as “Pope emeritus” or whatever he is calling himself. There are indeed irregularities, but to come to the certain judgment that Benedict is not Pope and Francis is requires weighty evidence in the public forum (not so and so said that in some private letter somewhere), and ultimately, a judgment from the Church. Several people are making this argument now. However, I have read Benedict’s resignation in the original Latin, I have never read any English version of it, and I have not seen how it is he did not resign the Papacy. It is a teaching of our Holy Tradition that Catholics must be under the Roman pontiff, just as each Catholic in his own diocese is under his rightful Bishop, in order to be a true member of the Church and be saved. I have to caution you because without the proper evidence your position becomes rash, and can have serious consequences for your soul. I pray you look at this again. Deo Gratias. Christus Vincit. Let us carry our crosses and prepare for Battle. Mater, Ora Pro Nobis! Malia , I think, is a follower of the false visionary Maria Divine Mercy, which is why she calls Francis a ‘false prophet. Stay away from all this garbage. Dr. Mark Mirivalle of Franciscan University has written a theological rebuttal regarding this false visionary who refuses to speak to the church. They say assumption is the mother of all “F-ups”, which always leads to fabrication and denial of all sorts of things. I say quite right! So I’ll reiterate my stance again. FRANCIS IS THE FALSE PROPHET!